"Donna Weaver has put everything into The Breakers, a Bed and Breakfast that she and her mother are opening on a remote stretch of beach. Now it waits - freshly painted, richly furnished, filled with flowers. Someone has broken their vow. Someone is playing games. 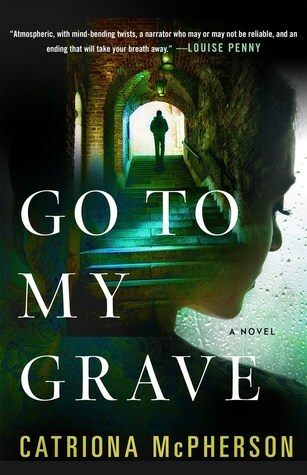 And then the games turn deadly... "
Go To My Grave was a dark and compelling thriller that left me wondering why I hadn't read anything by this author until now. One of the things that made me want to read this one right away was I saw a review somewhere that compared this book to the game of Clue. I loved that game as a kid so I was instantly intrigued. I can't say that I agree with the comparison but I still really enjoyed this book. This was one of those whodunnits that kept you guessing from the very beginning. And there was this sense of foreboding that was present throughout the book which I just adored for the most part. I'm not going to lie - there were times where I almost wanted to stop reading this book because of that feeling. Because you just knew that bad things were going to happen and I wasn't sure I could handle reading them. I feel like there are some serious trigger warnings here so readers be warned. This book is dark and not always easy to read because of it. (If you want specific trigger warnings just let me know). The book is told in two storylines: the present day and then what happened many years ago. The author beautifully ties these two storylines together and in such a way that I just did not see it coming. I found myself unable to stop reading as I just needed to see how it would all turn out. I'm going to admit that I was strongly satisfied with the ending as it just fit perfectly in my opinion. Overall, I enjoyed my time reading this book immensely which feels a bit wrong to say as it was so unexpectedly dark. I don't want to harp on that too much but I just feel like it is important for readers to be aware and understand what they are getting. I spent my entire time guessing with this book and was nowhere close! This was one of those books where the author brilliantly has you guessing and wondering just trying to figure it all out. I never knew what to expect and loved every minute of it! I'm so excited that I have many more books by this author to catch up on. Question though - are all of her books on the darker side or just this one? Not that it matters but I was just curious on what to expect. I would recommend this book to fans of mysteries and thrillers. Bottom line: A dark but very compelling read! Disclosure: I received a copy of this book thanks to NetGalley and the publisher. Thoughts are my own. I have this one to read too and am eager to start it. Well, it's been on my shelf for a bit, but you know what I mean. Catriona McPherson writes a historical series and a cozy series and then she also writes standalone books that are darker. Amazingly enough, I've never read any of them, though I own a bunch. She's one of the authors that I hope to focus on a bit this year. She is lovely in person - funny, charming, Scottish, funny, did I say funny? Truly. Search on my blog under her name. She is a regular attender of mystery conferences and I have a bunch of pictures of her and stuff. I have this one but haven't read it yet. I love the sound of it but I read a previous book by her and didn't love it so I guess that's why it never made it to the top of the stack. I'm going to have to give it another try and pull it to the top of the pile.